On Tuesday, I reviewed a sherried independent bottling of Tobermory. Today and tomorrow, I'm going to take a look at two versions of the main bottling of Tobermory's official range: the 10 year old. Both of the whiskies above are Tobermory 10s, but from different periods. The one on the left was bottled at 40% ABV, held caramel colorant, was very likely chill filtered, and was available from approximately 2002 to 2011. The one on the right is the newer version of the 10 year old. It became available in Europe in 2010, then in the US in late 2011. That one is bottled at a stronger 46.3% ABV, is neither colored nor chill filtered. Their colors look a little different, don't they? Tomorrow, I'll write about the one on the right. Today, I'll be talking about the whisky on the left. 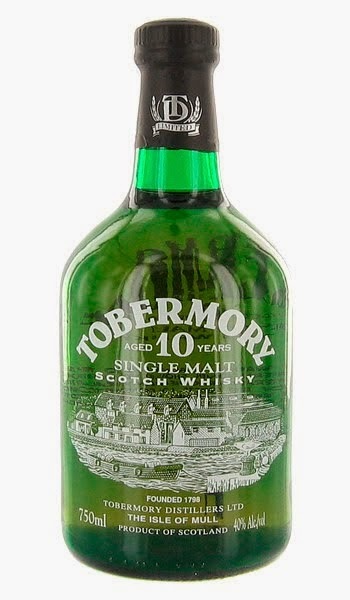 The Tobermory 10 year old "Old Label". The color is a brownish gold. A little brown-er and less gold-ish than than whisky usually gets on its own. The nose is very quiet, almost like a cheap blend. It takes some time to wake up and even then some clear nasal passages are required. First, apple skins. Then floral soap, caramel, and burned oats. With more air, the soap recedes, replaced by milky oat flakes and corn flakes. Then cardboard and maybe peach juice. The palate is very grainy, like a bottom shelf blend (Lauder's minus the vodka notes). But it's also very bitter with an strong odd burnt note. I know there are two schools of thought regarding if industrial caramel colorant can actually be tasted -- it can or it cannot -- but I'm wondering if the chemically bitter burnt thing is e150a, because it doesn't taste like a naturally derived flavor. Beyond that, there's some uncooked rice and hair (also uncooked). That bitterness carries over into the finish. Also some more burnt stuff with dusty caramel and notebook paper. I wasn't going to add water to this since it was already so thin, but then I did so anyway to see if the whisky could be saved. The apple note grows in the nose. But so does something that's reminiscent of rotting meat. That note isn't large, but it's there. Above it is cilantro, cinnamon, caramel, and cheap perfume. And there's the vodka note that was missing in the neat palate. No vodka in the watered down palate, though. The good news is that the bitterness has lessened. But the only other element I can detect is uncooked oats with fake maple flavoring (Quaker's Instant?). The finish holds only one flavor: Kaliber, Guinness's ghastly non-alcohol beer. The good news? Three things: 1.) The nose was almost fun when neat. 2.) The palate wasn't horrible with added water. It was plain and easy to sip. 3.) I felt no guilt dumping 20mL down the sink. The rest is bad news. As a Tobermory fan, I was very disappointed. I had thought this edition of Tobe was disliked because of weird cereal, grassy, yeasty things -- and was actually looking forward to that experience. But the reality is that this is $9.99 bottom shelf blend material. On its LAWS page, they show it has having been $31 back in 2008. That's unfortunate. The LAWS dudes give it a C. Serge gives it a 70. Averaging out the two sets of old 10yo scores on Whiskybase, the public gives it a 74.11. They're all being a little more generous than I. Keep in mind, all of this is regarding the older version of Tobermory 10. Had this version been a hit, Burn Stewart Distillers wouldn't have made some drastic changes to the brand. But they did and for the better. More on that tomorrow. No wonder Tobermory has such a bad rep. If that's what they were putting out for years, even the better, reformulated bottle will have a serious hurdle to overcome. Just saw on the Malt Monitor that the average of 9 Maniac scores on the 2002 release of this Tobermory was......66. My hope is that the complete overhaul inspires people to give the new one a try. 'Cuz it's worth it! I'm still curious about a full bottle of this old Tobermory - although I passed last time I saw it for $30. You know I'm a bit distrustful of minis. I expected you'd find a full pot of cooked cabbage and broccoli in there, farts and all. Maybe in tomorrow's version. I'll have a dram of that in anticipation! I also think I'm on the side of those who believe that e150a has a detectable bitter flavor. Rather than finding out if that's true, I'd rather avoid e150a altogether. I'm making an effort to do that in the full bottles I purchase, but for the sake of science I won't limit this blog's reviews to uncolored whisky. Yet.